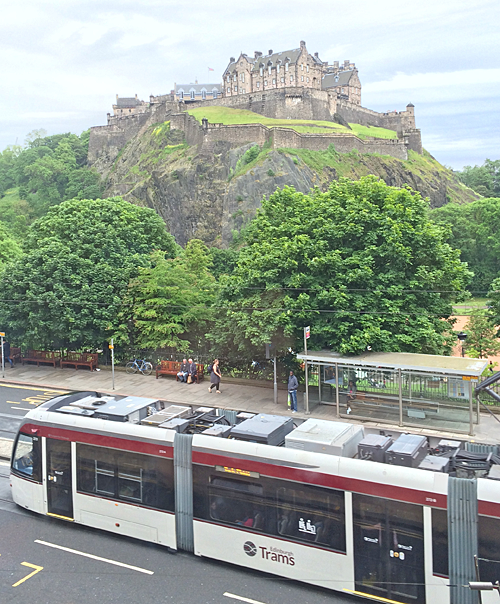 The trams are running in Edinburgh, after 6 years of construction, stalls and turmoil. It’s a nice ride, described well in a recent post by blogger Gillean Somerville-Arjat: “It doesn’t shoogle or wobble and hurtle you about with sudden braking as the buses do.” I think of gliding down Princes Street on a tram as something like being in a mood. Constancy. Words with an “oo” (or ou) in them sound smooth (depending too on the surrounding consonants), like the nonsense word bouba. People who have “found their groove” have a smooth ride, are on the move, and easily soothed. Whether good or bad, a mood is a condition with some constancy, like a gliding tram: whoosh. Sensory engagement. There are many sounds associated with movement, and rapid movement activates the sensorium in ways that a stroll doesn’t, as when a dog sticks its head out of a car window and gulps at the wind. Travel is a mood changer, or amplifier. Comfort. Travelling well means being safe and feeling it — cocooned, in a gliding refuge. Some people like being locked in a metal tube, and with others in control, attended to, coddled and fed drinks and snacks (as on a plane or train). To travel you have to be isolated from the effects of speed, the roughness of the weather, water, and other extremes. There’s security in that, and perhaps contentment conducive to a meditative state. Sociability. The economics of travel requires that people congregate. Travel means there’s always something to talk about, as the view changes, and someone to talk with, if you want that. It may even encourage sociability, or tactics to remain isolated (e.g. during rush hour). Variation. Fast travel inevitably takes you through different places and across thresholds between places. It makes lots of things the same, but also renders transition effects obvious, as when you pass from the city to the countryside, exit a tunnel, or turn a corner. There’s excitement in that. Prospect. Travel that’s faster than walking reveals new prospects. So some people prefer to ride the top of a double-decker bus. Planes provide obvious prospect, especially when close to the ground and you can see things. Trains and trams do it too — now I know what a switchback is. Parallax. The foreground appears blurred and the distance comes into sharp relief. Apparently this is an example of the “ethics of disappearance,” according to Paul Virilio. Geometers and photographers know that movement make obvious certain spatial relationships and occludes others. Connection to the ground and sky. Trams hug the road surface. Planes hang from the sky. In either case fast travel privileges the sky in the visual field. This relates to item 7, and vertigo. Anticipation. There’s a destination in mind. Expectant moods pervade travel, in prospect and while on the move. Flight and fright. You can see it in a passenger’s expression. Interrupted progress frustrates them. Movement is part of what it is to have an emotion, according to William James. Distance travelled. 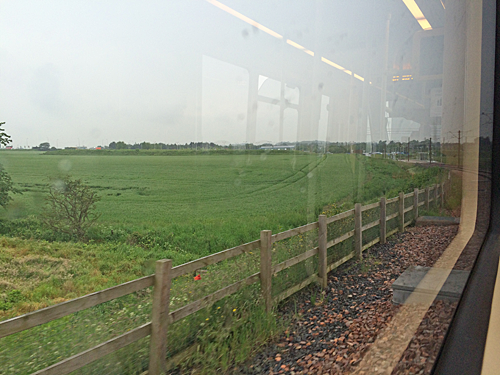 The tram ride to Edinburgh airport takes 35 minutes. But it brings to mind longer journeys, and there’s melancholy in that. Excursion and return. You have to come back at some stage. See blog post: Oblivion. Kamvasinou, Krystallia. 2010. Notation timelines and the aesthetics of disappearance. The Journal of Architecture, (15) 4, 397-423. Search online for “bouba kiki” to read about (b)oo sounding words — like Google. Thanks to John Lee for referring me to Gillean Somerville-Arjat’s post. It’s interesting that the happy planet index test of the NEF (new economic foundation) asks standard mood and lifestyle questions but also inquires about how you travel. Walking is good for you and the planet. A few long holidays are better than lots of weekend breaks that involve getting on a plane. A trip to Australia blows your share of the planets resources by 2.5 times through the flight alone (I think). Trains are good. In an interesting book on cinema and the city, Richard Koeck notes: “In probing the relationship between the city and the moving image, the question of movement and mobility, and, by extension, that of time and ‘rhythmicity’ … , reinforces the essentially dynamic, affective and ’emotional’ … properties of urban space” (p.13). That’s another link between mood and movement. In so far as we experience the city cinematically we participate in both the movement and emotional power of cinema. 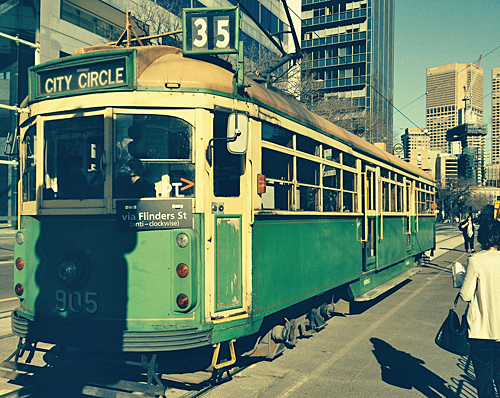 Early Melbourne tram. This is the model that came after the open sided model that had pull-down canvas shutters and lacquered wooden seats. « How bored is your dog?